We want our dogs to grow up to be the happy and confident and not be “that dog” everyone avoids. You probably hear trainers and vets talking about these buzz words; socializing, desensitizing, etc… well at least I hope you are. These two things are very critical in raising a dog. You have a very short window in their lives to get this right, so get to it and most importantly-HAVE FUN! To have a happy and confident dog you need to expose them to everything possible in the first few weeks of coming home. Like you have nothing else to do but drag this pup around the neighborhood, and experience everything they could possible come into contact with over the next 12-15 years. Yes, you would be surprised on how much you can do on one walk during a busy part of the day. I was once told that in the 4 weeks of bringing my pup home I should see about 400 people. Not only that but they should see people of every age, race and size. WHAT! Where am I going to find that many people? Going to the vet is an easy place to get a group of people to dote all over your puppy. You will have about 2 vet visits in this time frame so take advantage of it. You could possibly hit the jackpot and have a busy waiting room filled with other dogs and kids, but my luck never works like that. Kid exposure is easy, especially if you have kids living with you. For those who don’t or need more, go to a park on a sunny weekend. You will find tons of kids. Bring some treats with you, so you can work on kids giving your pup treats for sitting nicely. Two birds one stone — you work on not jumping on people because you are asking them to sit. If you don’t have a park nearby try to time your walks around the local kid’s bus pick ups and drop offs or walk passed the school at those times. Find some local stores that allow pets, usually the home improvement stores love having dogs come in to shop. Just make sure you spend ample time outside working on “potty time” before going in, or you may find your self buying a roll of paper towels and cleaner (trust me). Once inside you can find lots of people to come pet your puppy, believe me no one passes up petting a cute puppy. Not only does this give you people exposure but also noise exposure. I’ll get to that in a little bit. Don’t forg et that socialization also includes other dogs. We shouldn’t expose our pups to lots of dogs or dog places until all those shots are up to date. So what do we do? I like to find small dog stores that don’t have large masses of dogs walking around and of course the vet’s office. Hey you may even run into a dog or two at those local home improvement stores. If not, try to recruit some of your friends that have dogs or neighbors. I only let them meet other dogs that are dog friendly and are up to date on shots and also one on one. I don’t like to have a pack of dogs meet; I’ve never seen anything good come from that. Letting dogs meet on a walk and sniff each other is good too. Just try to find dogs that you feel comfortable with and won’t cause a bad experience for your pup. With all socialization always watch for signs of stress or signs of being overwhelmed. The last thing we want to do is stress them out and have a bad experience. I don’t like huge mobs of kids coming over and having 20 hands grabbing at a pup. One or two at a time is fine and not for hours on end. Never force an interaction. If your pup would rather sniff try having someone hand them a treat, and if they don’t want it then oh well. You wouldn’t like it if every person you came across made you stop what you are doing and hug them. Sometimes it could also go the other way — your dog is the one seeking out everyone you pass. You have to teach them that not everyone is there to come visit them. Just give a little yank on the leash and keep walking. Let’s move on to noise/life desensitization. You would be shocked to hear some of the items I hear dogs are afraid of. I put life in this category because there are things, for what ever reason, our dogs decide they want to be afraid of it. Once again we want to be able to expose them to all kinds of sounds: vacuum, blow dryer, blender, garbage disposal, things that make noise in your house and outside your house. I have had dogs afraid of plastic bags, rolling garbage cans and even items that move (bikes, scooters, cars, thunder, etc). Why are they afraid? They have never heard the sound or it startles them. Their first reaction is to run for their life or bark at it. If they do either don’t let them. When they run go get them, hook a leash on, and bring them back to it. Get some treats and have them sit and keep repeating until they understand nothing is going to happen to them. I do the same if they are barking at it. Once they realize there is nothing to it, they become desensitized to it. 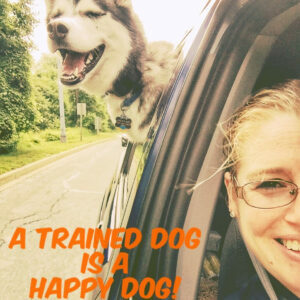 I like to do training sessions around things that bother them, whether it is the garbage truck picking up on trash day or kids playing on their bike. Get them to focus on you and the reward rather than things going on around them. After a few minutes they will forget what was bugging them. The last thing you want is for them to get rewarded for being scared. That will just promote the fear. When you have a fearful/reactive dog you run the risk that one day the dog will react or flee and neither is good. We also want to be able to touch our dog anywhere. Sitting on the floor with them right from the start and being able to touch their ears, snout, teeth, paws, nails, body and tails. With new puppies I do this every day several times a day. If you have others in the family have them doing it too. This will help when it is time to groom them or go to the vet not react when touched. If conditioned correctly they will understand that this is what humans do and should not get upset over it. I have seen hundreds of dogs as adults not be able to get their nails trimmed because they want to eat anyone who touches their paws. 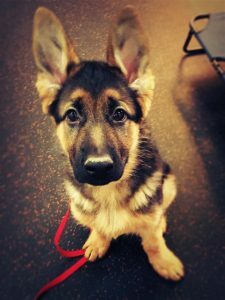 With all of our training from puppy to adult we stress how important it is to be doing all of these great things. I tell clients it is never to late to work on these things and to be working on them every day. 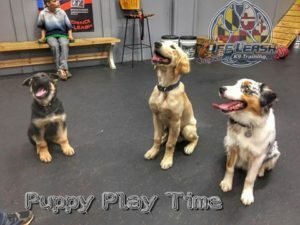 Posted in Blog and tagged #OLK9MD, puppy training. We can help your dog.